A diamond stick pin finds a new home as custom designed jewelry. It’s in a box on the top shelf of your closet. Or maybe it’s in a sock in your underwear drawer. Doesn’t matter – we all have it. That hidden stash of Grandma’s jewelry. It’s not that we don’t like it. We just don’t know how to wear it again. I mean, really, who wears stick pins anymore! That’s where Scott’s Custom Jewelers comes in. An elderly woman brought in a small pouch of old jewelry for us to evaluate. Some of it was costume. Others were sterling silver pieces, now black with tarnish. After a little dipping and polishing, we brought those pieces back to life, no problems. But there was that diamond stick pin. And Grandma’s plain white gold wedding band. The solution was almost too simple. 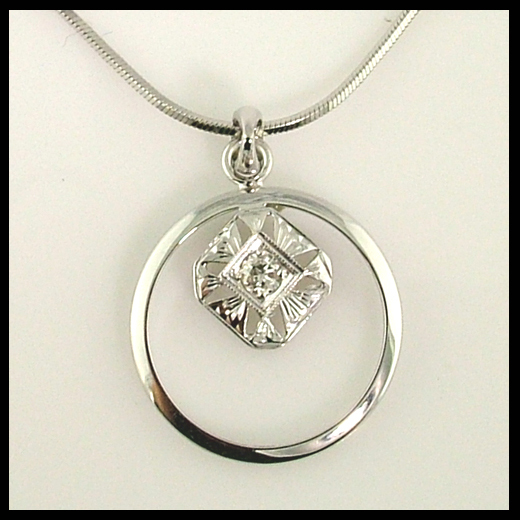 We used the wedding band as a frame, and attached the top of the diamond stick pin to the piece, creating a very modern, yet vintage, pendant. 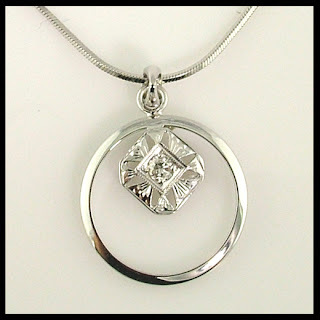 We simply polished the finished custom diamond pendant, and hung it from a chain. You could even still see the original engraving on the inside! The woman was ecstatic! Even better, her 20-something granddaughter, who was with her, asked if she could wear it for her wedding! Something old and something new, all in one! It’s amazing what you can do with a little imagination. What’s lurking in your closet?